Bose is one of the most trusted brands in American consumer electronics with products distributed all over the world. With over 50 years of dominance in this field and after gaining the respect of consumers and competitors alike, it is only expected that Bose delivers to its promise of quality and excellence. Among the most popular products of Bose are their headphones. 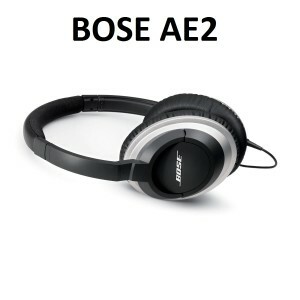 The Bose AE2 and Bose SoundTrue Headphones in particular are two of the highest rated products the brand has in terms of around-ear audio headphones. Bose SoundTrue is actually an improved version of the Bose AE2. The Bose AE2 Around-Ear Audio Headphones is a no-nonsense set of headphones. It has become one of the favorite pair of headphones of countless consumers which only gives sense to the almost perfect rating it received from over 900 customers alone. These headphones keep it simple with a black and gray color; but don’t let its simplicity fool you as it is packed with all the power you need. The Bose SoundTrue Headphones, on the other hand, is an evolution of the earlier Bose models including the AE2 which took into consideration the wants and needs of the most discriminating consumers. Bose did a great job in listening to the demands of their customers as they were able to come up with this pair of headphones that doesn’t only boast of superior sound quality but a sleeker and more playful look as well. Both the Bose AE2 and the SoundTrue Headphones are equipped with detachable cables so you can store your headphones without worrying about tangled wires. It is important to note though that these headphones do not function wirelessly. The detachable cables are merely for more convenient storage. Both headphones also give priority to superior sound and comfort. Bose understands how music enthusiasts want to maximize the beauty of sound so with these pairs, you can expect amazing sound production, crisp and clear structure that even professional music producers will appreciate. The need for comfort isn’t ignored either as the Bose AE2 and Bose SoundTrue Headphones are both lightweight and ergonomically designed with adjustable cushioned headbands to fit most head sizes and to give a perfect fit for use for hours on end. Though both Bose models are attractive-looking and built with lightweight materials, consumers are rest assured that the manufacturers didn’t play around with the durability of these headphones. Both come with carrying bags so you won’t have to worry about your headphones getting squished inside your bag. Both are made with high quality materials that offer incredible durability to guarantee performance for years. What Might Make You Reconsider? No product is the same and no product is perfect either. Of course, these salesmen and advertisers will tell you about how awesome a certain product is, but in reality, there are hidden shortcomings that you can only find out through reviews and customer feedback. If you’ve almost made up your mind on either the Bose AE2 or the Bose SoundTrue Headphones and you just need to know what could go wrong or what can make you reconsider, read on. Bose has its own share of “bashers” and “haters”. Much like a successful celebrity who’s just doing his thing, some just hate on the brand and forget about the performance. These bashers have created quite a confusion among consumers because they made it difficult for a regular customer to spot the real from the not. Bose does not need the most popular rapper or singer’s name on their headphones. The trust and reliability that their brand built throughout the years is enough to keep their loyal customers and gain countless more from all over the world. For the Bose AE2 in particular, there’s no problem at all with the sound quality and the comfort it offers. Bose played their game well by making this a super durable pair that should last for several years of everyday use. What it lacks though is style. It sort of looks like a pair of headphones one would use in front of a computer while listening to some classical music or an e-book. However, the physical appearance is merely a subjective point to look at as some customers appreciate simplicity more than a more modern look. The Bose SoundTrue Headphones is pretty much the improvement any loyal Bose customer is looking for. Better sound quality, a more comfortable fit and a more impressive design. The only downside to it is that it is quite on the pricey side. It is quite an investment if you don’t intend to use it professionally. 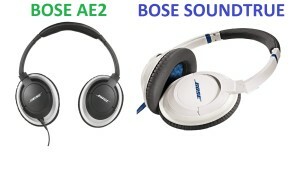 However, it is good to note that other similar Bose models sell at higher prices. 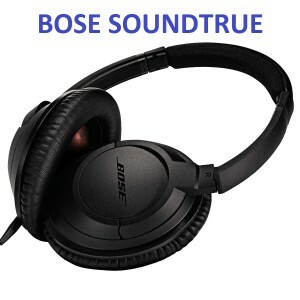 With the features it offers, the Bose SoundTrue Headphones comes cheaper than other similar headphones from other brands. You are essentially paying for the quality and durability that Bose can promise. With over 50 years in the business, you can’t expect anything less than excellent. These aren’t the thoughts of a professional music producer or a sound engineer that uses headphones to make a living. Rather these are thoughts that came from actual customers who merely own headphones for everyday use. As much as there are some consumers who place the Bose AE2 headphones as a regular pair of headphones that isn’t out of the ordinary, the majority of customers who purchased this pair praised its durability. They already expected excellent sound quality from a Bose so most weren’t surprised at all at how great this pair is. Furthermore, many customers said that the Bose AE2 was super lightweight and it fits just right, you’ll forget you have them on. The Bose SoundTrue Headphones received even more praises from customers who purchased it. The comfort and the appearance of the headphones are without a question impressive to most customers. The sound quality is what most customers raved about as they were truly impressed at how the sound was rich, crisp and clear—just like what you would expect from more expensive professional headphones. Whether you choose to purchase the Bose AE2 or the Bose SoundTrue Headphones, you can expect any of these to exceed your expectations. Both reasonably priced and packed with impressive features, you can practically take a random pick and you will still be satisfied. However, it is worth to mention that the Bose SoundTrue Headphones is what’s truly hot in the market right now and it is because of a valid reason—it is the newer model and a lot of improvement took place. Better sound, better comfort, better fit and better design. If you’re looking for an upgrade for your current headphones or you’re making a decision to finally invest on a good one that would last for years, without a doubt, the Bose SoundTrue Headphones is a practical and great choice.